It started with the baby boy clothes. I carefully divided them into two piles: what would fit my nephew and what was too small for him. Each tiny onsie and legger brought back memories of chubby thighs and soft tummies, wobbly legs and curious hands. Box by box they left our house, clearing much-needed space in Eddie and Charlie’s closet. I kept only a precious few items: a baptismal outfit, an Easter sweater, a onsie with a name on it. I felt a pang, but we weren’t having anymore babies, and Alice wouldn’t wear any of those clothes. They may as well go to someone new who could use them and love them rather than sit in a closet in our house. Then Alice started growing out of her clothes, and other than an Easter dress and a tiny pair of shoes, those were passed to my just-born-yesterday niece. I didn’t have as many feelings about those; after all, only one baby wore them and most were hand-me-downs. Those things weren’t as difficult to let go. But now, Alice is growing out of the infant things–stuff we have had since my baby showers for Eddie seven years ago.. Items that have been a part of this stage in our life, representing the “child-bearing years”. When she grew too big for the swing, we passed it on to my brother and sister-in-law as they await their first born. That was…difficult. That swing was the first place both of my boys slept when they came home from the hospital. Alice was the only baby who loved it enough to use it often to soothe her. The swing in the corner was a symbol of the babies we were having, the expansion of our family. It’s gone now, replaced with a jump-a-roo. Some of our items are getting claimed before Alice has even outgrown them. Our rock-n-play and car seat’s bundle me are going to one family, the infant tub and bounce seat to another, and the bumbo and tray to our daycare. I love that we can give these items to people who need them and will love them like we did rather than dropping them off at Goodwill to go to a faceless family. It was also important to me to give the items to people since they were all gifted to us; making money off of them didn’t seem right to me (not that I am judging you if you sold off your stuff. That was totally my plan too, until it came time to actually do that. Then I just couldn’t). I’m really good at purging our house of stuff; it feels good to clear out things we don’t use to make way for extra space or new things. But this is different. It’s harder. Last night, at bedtime, I had a mini-panic attack. I had been snuggling Alice after her last bottle and I was thinking about my new niece who had been born that day. I had also watched a video that popped up in my Time Hop of a little 4-year-old Eddie talking about what he wanted for “Cwis-mus”. We are done with the newborn phase of our life, and every single day I am reminded that we are slowly easing into a new phase of life. Newborns used to remind me of what we still had coming in our future, but now they will be a nostalgic symbol of our past. “As long as you don’t start buying replacements for them, I think that is totally normal and Ok,” Cortney reassured me in the darkness of our room. “Heh. I won’t,” I promised just before I drifted off to sleep. But a sadness had wrapped itself around me. Eddie’s toddler voice is gone. Charlie’s baby squeals are gone. Alice’s newborn days are gone. Whether I like it or not–whether I am ready or not–time is moving forward and we are all growing up and older. Letting go of the baby stuff and embracing the big kid stuff is harder on me than I thought it would be. 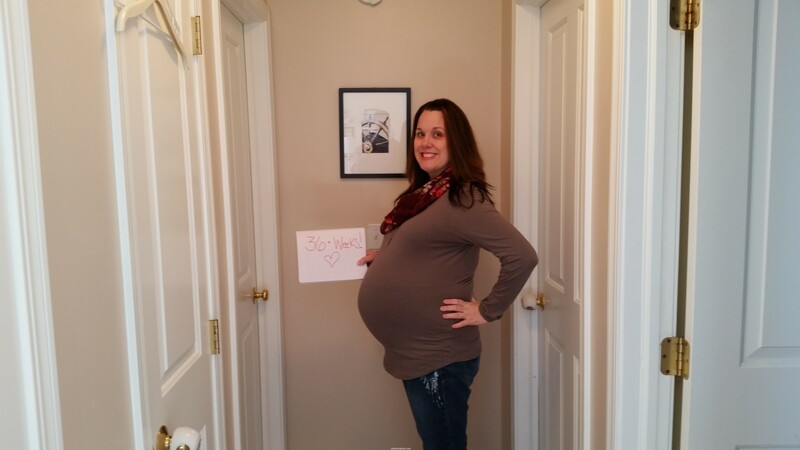 This weekend I passed the 36-week mark in my last pregnancy. We took my final pregnancy “week” photo…ever. Like I said before, pregnancy is hard for me. Oh, there are people for whom it is much, MUCH harder, I know. But it is still not my favorite state of being. No. I am not sure. But I am POSITIVE that I don’t want anymore of them to grow in my body. And my body most definitely agrees with me. I have officially been in the phase of “child-bearing” for seven years. I’ve had five pregnancies, two babies, and God-willing one more in a few weeks. It is enough. Even though I am more than ready to be done being pregnant forever, of course there is still the little twinge in my heart with those words “last” and “final”. I’m very aware every time she rolls or kicks that these are the last baby movements my body will feel. It’s the last time I will share my body. I can honestly say that it has been a miracle and an honor to share my body with all three of my children–to use myself to grow them and feed them and love them. And at the exact same time, it has been a rough ride. It’s an odd thing to hold such contradictory feelings at the same exact time. Being a parent does that to you though. I know it’s happened before having children, but all feelings and emotions are magnified when you bring small humans into the world. The line between love and loathing becomes extremely blurred. I love and loathe this thing called pregnancy. I have never loved anyone so hard as I have loved my children (and my husband since we’ve had children). I have also never felt such exasperation, defeat, guilt, and rage than I have since having children. I have never wanted to quit as much as I have being a mother. I have also never wanted to fight for someone else or myself as much as I have being a mother. I have never laughed or cried as hard as I have since my kids came into this world. I have never appreciated and hated the small things in this world…like a small hand in mine or crumbs in my favorite chair…so much as I have since children moved into this house. My heart now knows what it feels like to be filled and broken at the same exact time. Alice is scheduled to come into the world via Csection on the morning of Friday, March 6 thus ending my child-bearing years. We are all excited, nervous, and ready and not ready at all. Just as you would expect. The last “bump” pic from each baby. Because my blog went wonky for a few months, I haven’t been putting many pictures up. BUT that is FIXED! So I can finally share some bump photos. I had my 28ish week OB appointment yesterday along with my glucose test (which I passed! Woot! ), and I am measuring at 30 weeks. That is exactly how I was with both boys. I was was always measuring 2 weeks ahead by this time. So here we are at 20 weeks. I would say that my level of caring what I looked like took the biggest dip with my Charlie pregnancy. Either that or I was just gross that pregnancy. and 24-25 weeks depending on when I remembered to take the picture. I don’t look as bad in that picture with Charlie. But I hated my hair. Never make a decision to chop off all your hair when you are pregnant. and this is where I am with Alice now…the 28th week. These pictures crack me up because I can’t stop looking at how young and dumb I was when I was pregnant with Eddie. I had no idea what was coming. I know that sounds cliche, but I just didn’t. And with Charlie I was already tired thinking about what he could be like as a newborn (Eddie was a colicky mess). This time, as my OB says, I am a veteran. I know both the difficult and the easy things that could lie ahead. Because everything is looking great and exactly how I carried and measured with the first two, my OB has even spaced out my visits for me so that I don’t have to come in so often just to be measured. That means I only have maybe 5 more OB visits and then the C-section on March 6. For those keeping track, that means I only have 10 more weeks left. Ten weeks from today will be my last day of teaching for this school year. And then Alice will be here. Our family will be complete. I’ve mentioned that there is a THING that has been really blocking my writing lately as well as making life, well, a bit difficult for me lately. 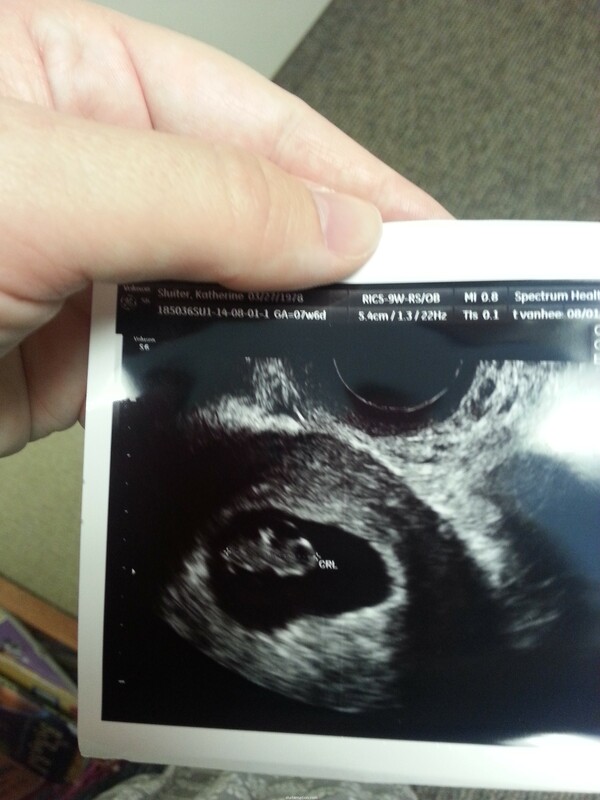 At 8 weeks, healthy as can be with a heartbeat of 177. And then we were still quiet because I wanted to tell my new principal before he found out via the social media grapevine. 12.5 weeks and healthy, although the first trimester was full of nausea and vomit and exhaustion (I am sure that explains some of my cancelled plans, facebook statuses, and lameness over the past couple months). Due March 13 (yes, Charlie’s birthday), 2015.